NABET-CWA Local 16 (CWA Local 51016) New York City. The National Association of Broadcast Employees and Technicians (NABET) is the Broadcasting and Cable Sector of the Communications Workers of America (CWA). Local 16 represents workers at the ABC Television Network and WABC-TV divisions of the Walt Disney Company, WABC-AM, WPLJ-FM, ABC Radio Networks. 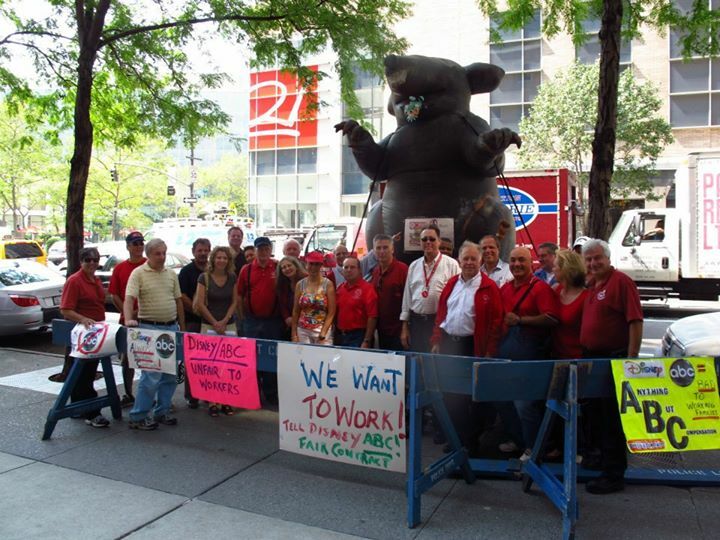 NABET-CWA also represents workers at four other ABC operations in Chicago, Washington, and San Francisco/ SoCal. Wing Chung 37 years and Mike Moran 41 years with ABC. When workers have unions, they have a clear path to getting health care, sick days, basic safety precautions, and better pay. Christopher Shelton (r.) was elected the new president of the Communications Workers of America by acclamation of delegates to the union’s 75th convention. Local 16 President Art Mazzacca and VP Jim Nolan were on hand to congratulate him.